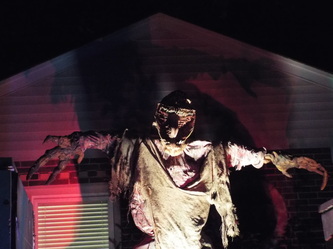 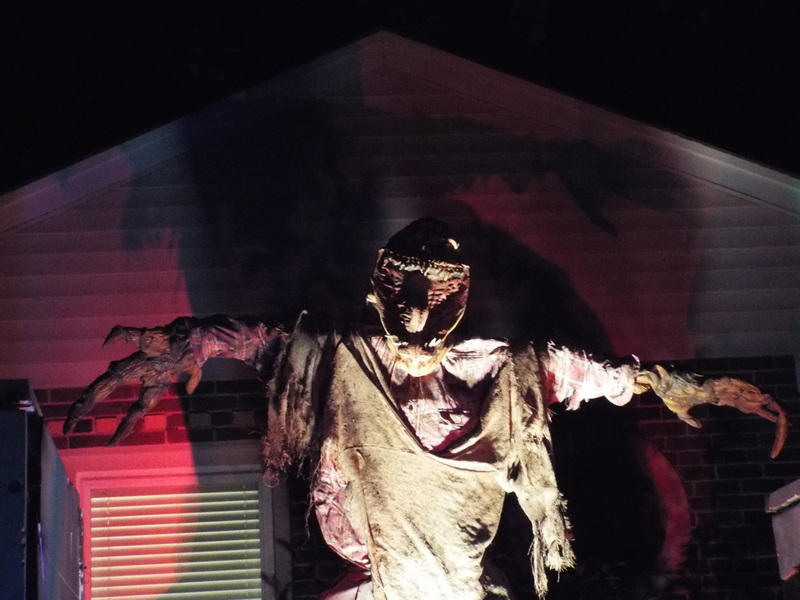 Nightmare on Page in another of the brand new haunt visits for the Tourers in 2013. 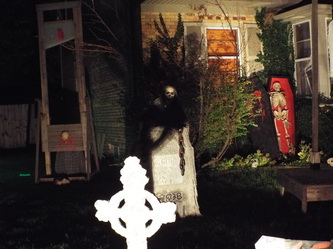 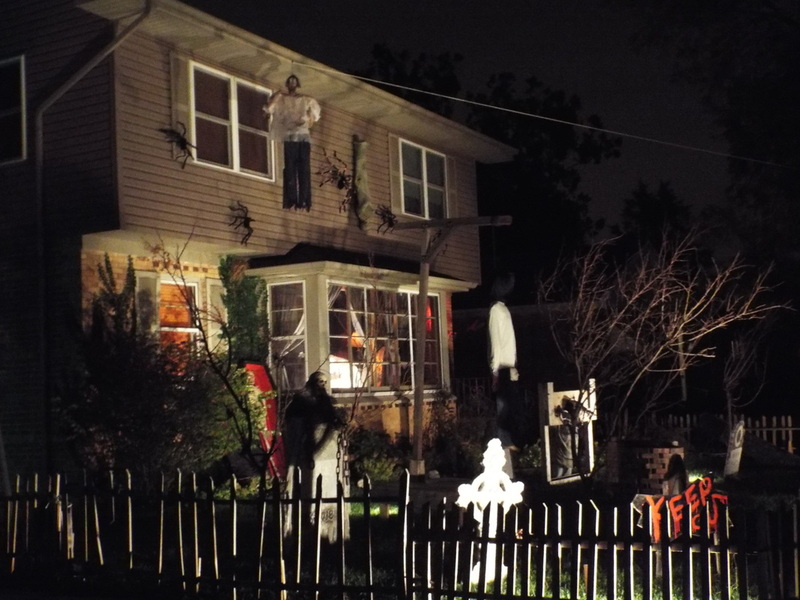 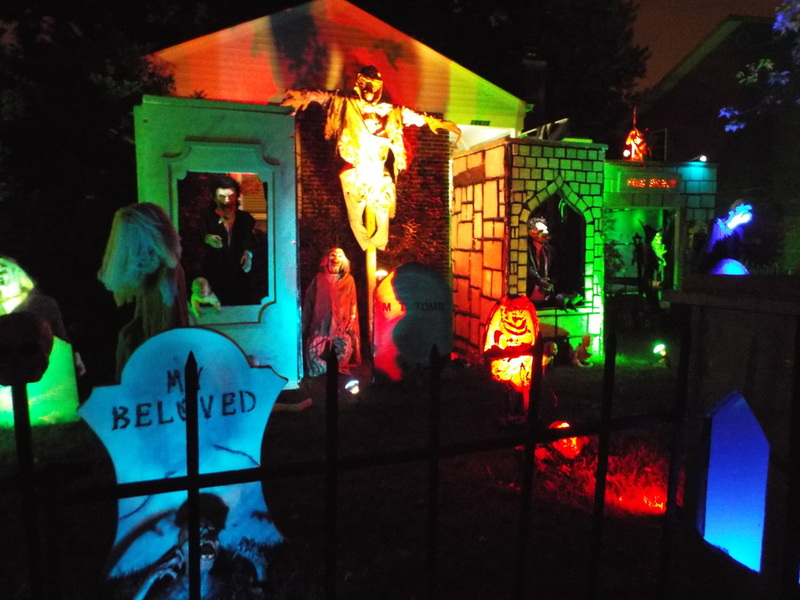 Fortunately for us, this one was located in the Chicago Southland, close to Horror Tourer home base, and near to other fine haunts including Haunted 4 Life, Haunted Hell, Misdom Manor, and others. 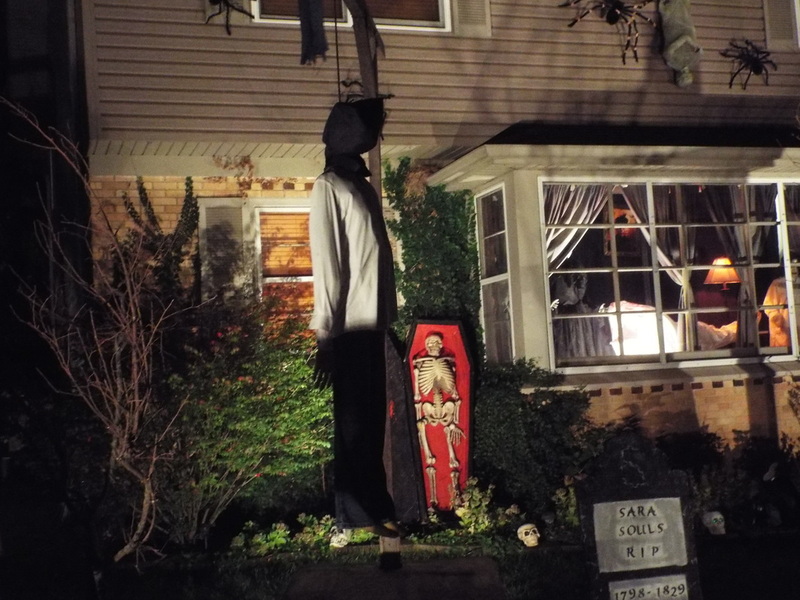 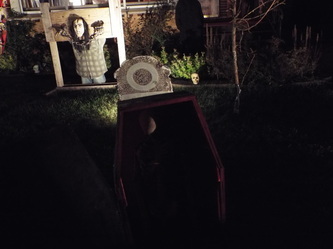 macabre, and featured (amongst other things), open coffins, a hanging man, and a full-sized guillotine. 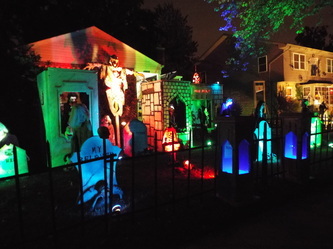 The fact that the two displays were different only added to the atmosphere. 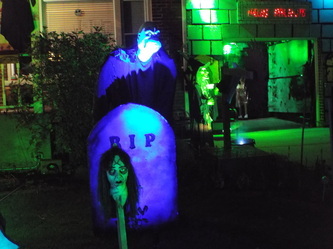 As mentioned, the left hand portion of the display had more of a “fun” Halloween atmosphere. 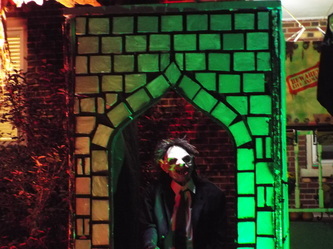 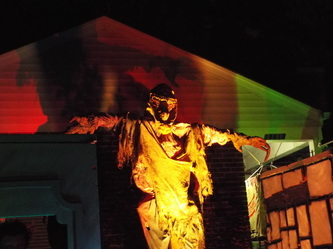 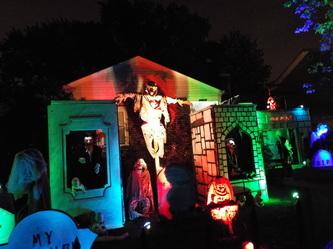 It featured numerous full size figures of varying types, including a strange scarecrow-like figure hanging from the roof, a figure that looked like a classic vampire in front of a tombstone, and a figure that looked like Leatherface from The Texas Chainsaw Massacre inside of a large structure that resembled a castle wall. 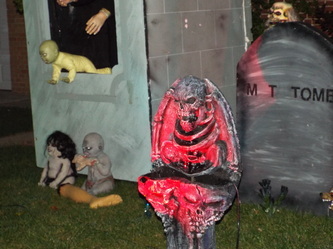 In fact, there were two such structures on the lawn, one of which had demon babies coming out of it. 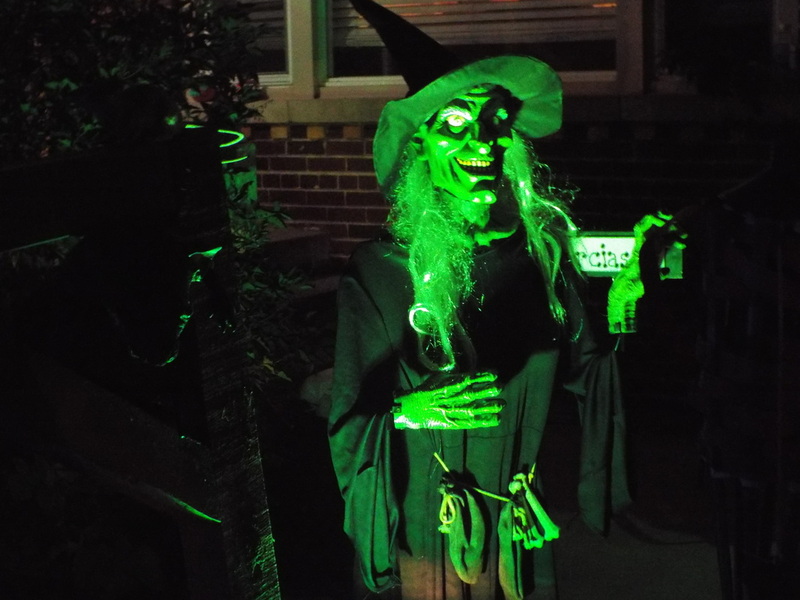 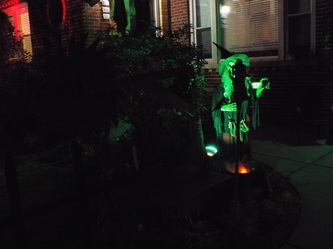 Also, there was a witch in front of a bubbling cauldron, a large saw-like device, and more. 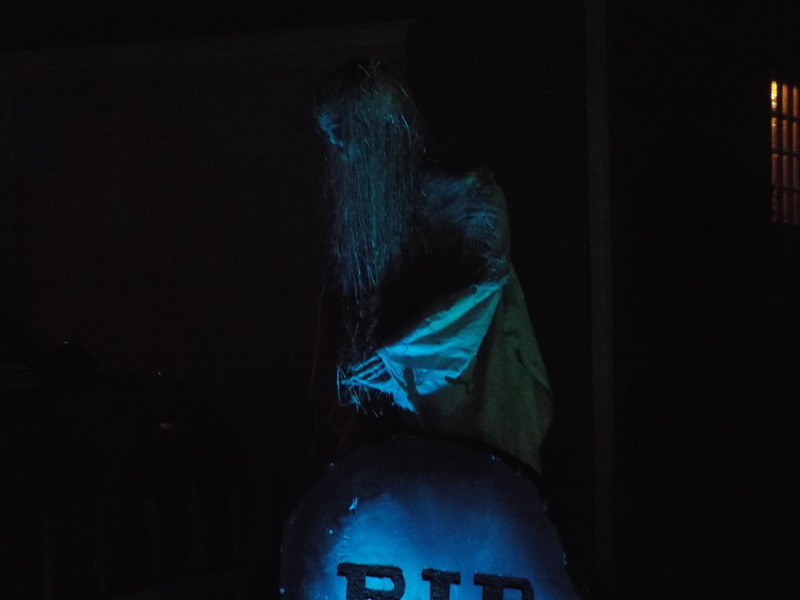 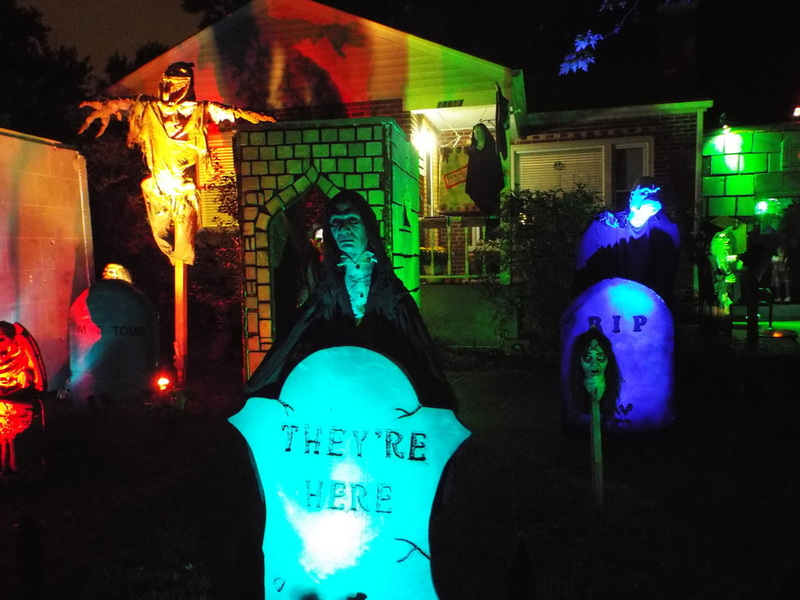 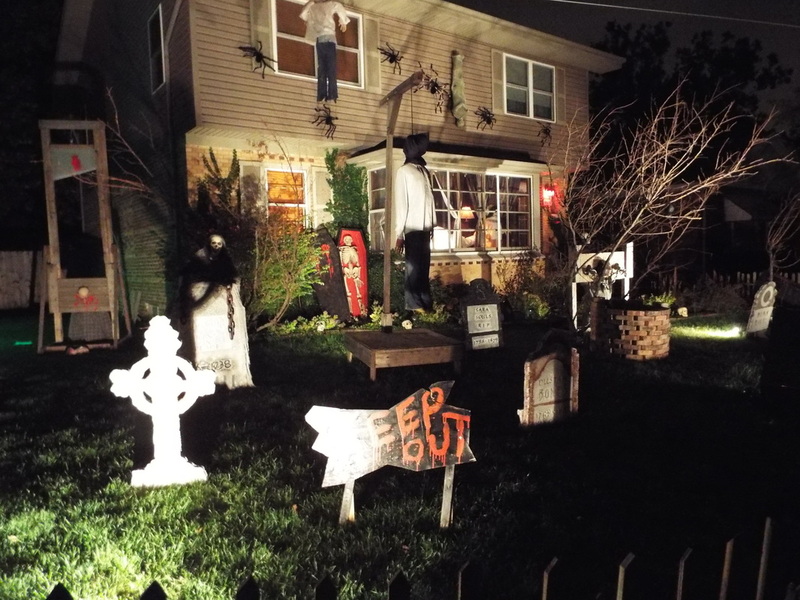 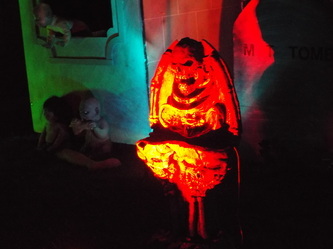 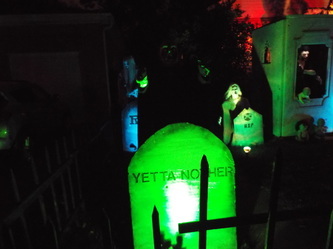 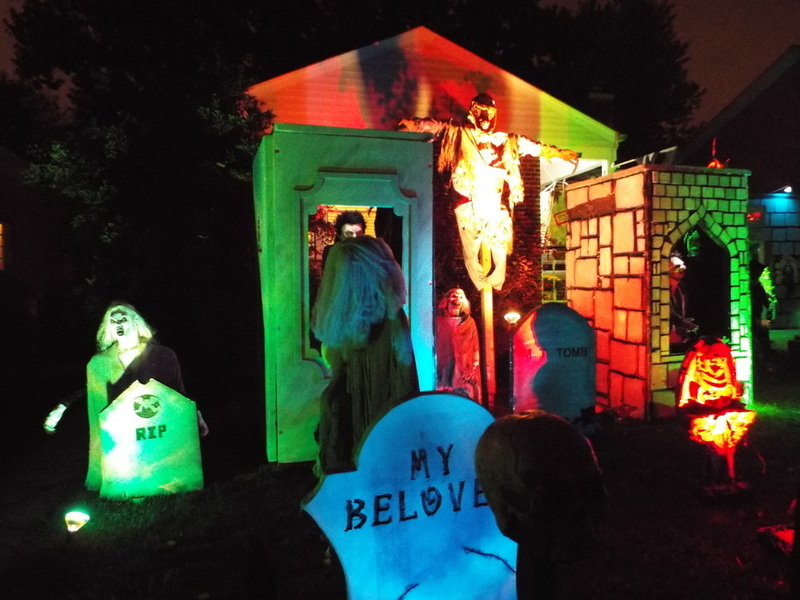 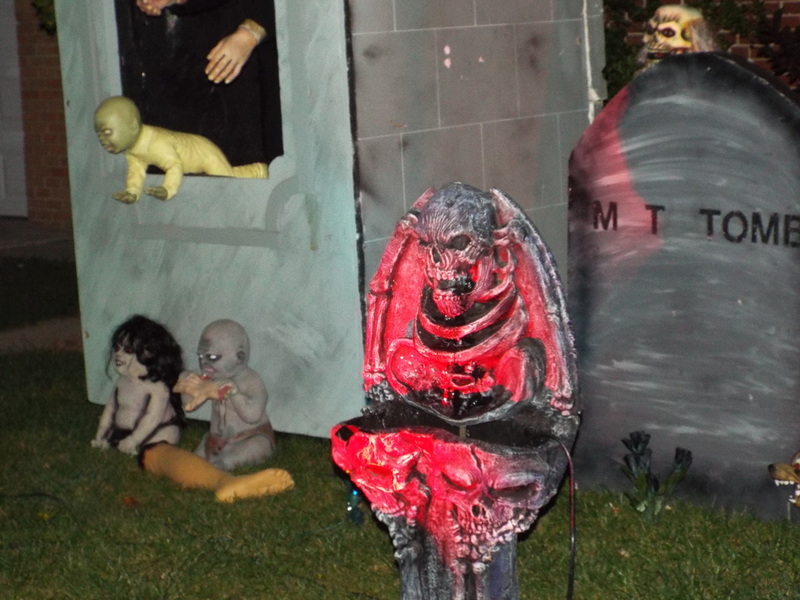 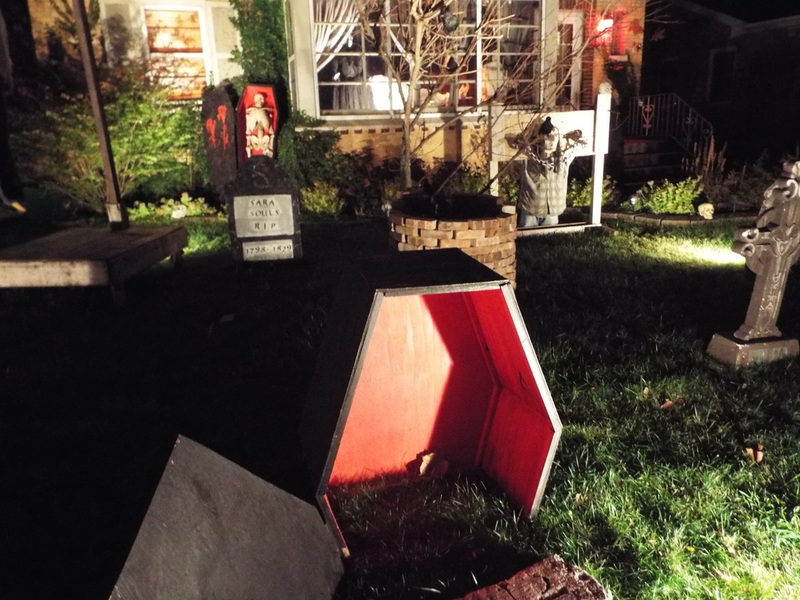 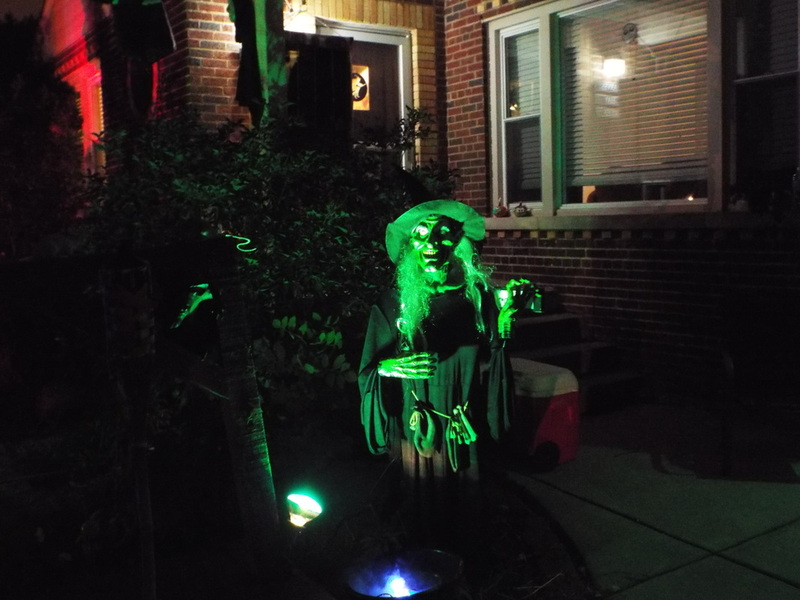 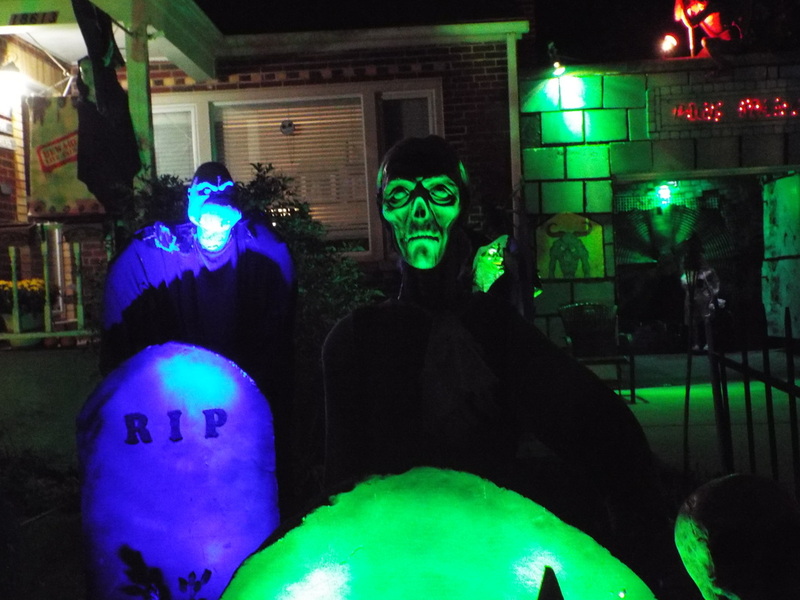 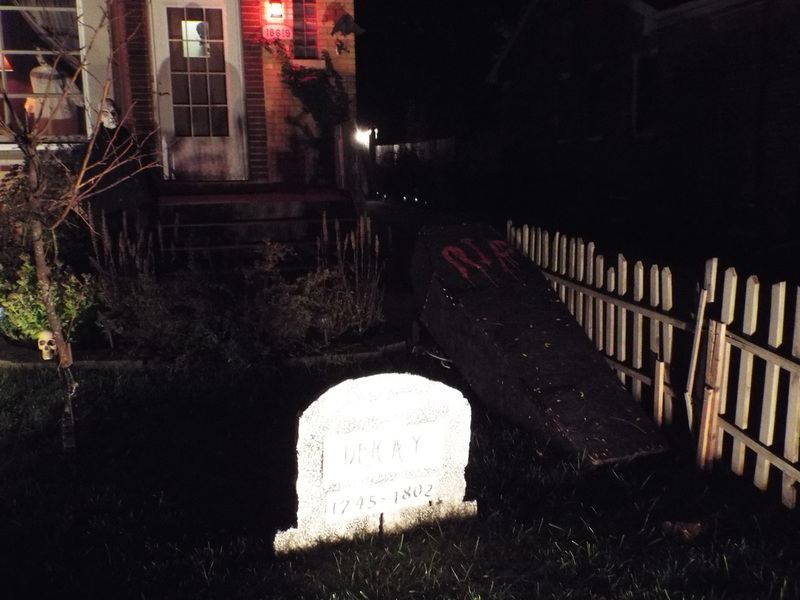 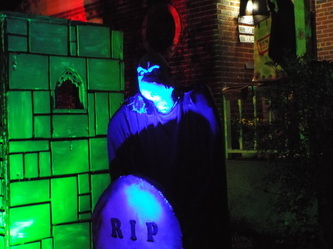 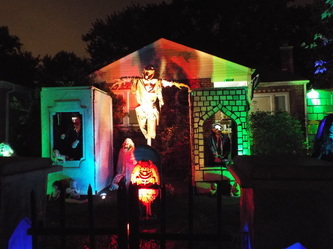 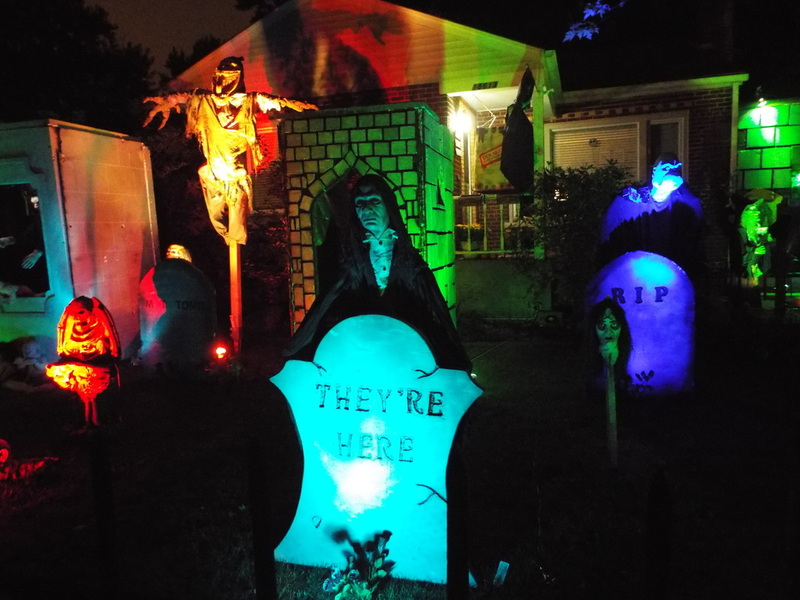 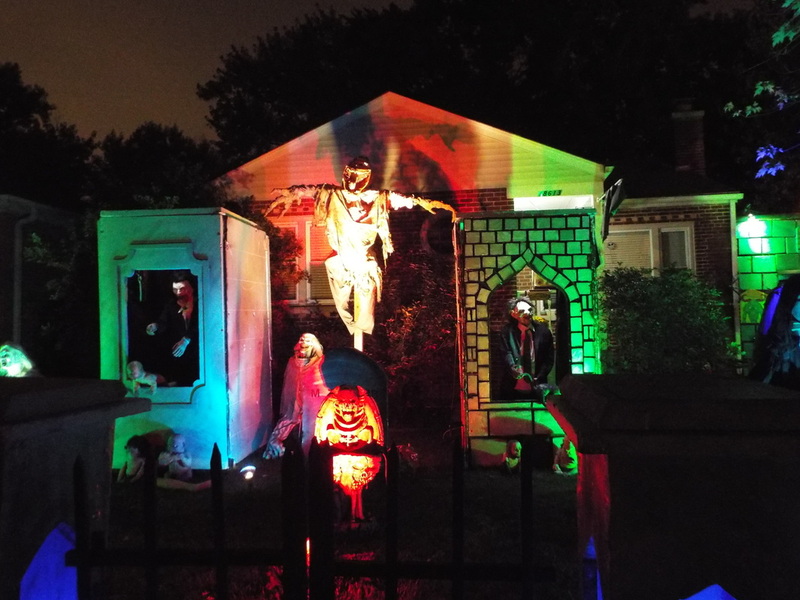 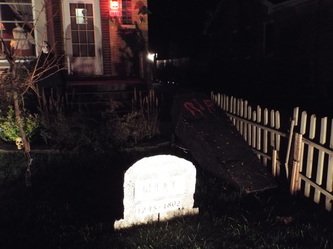 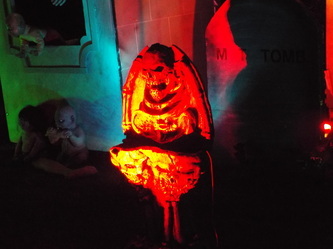 All of the figures and tombstones were lit in bright colors, including red, amber, blue, green and even purple. 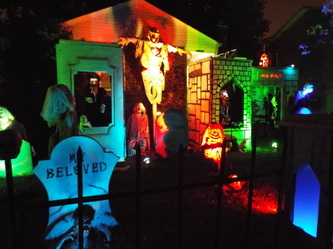 The lighting really complemented the setup and added to the overall atmosphere. 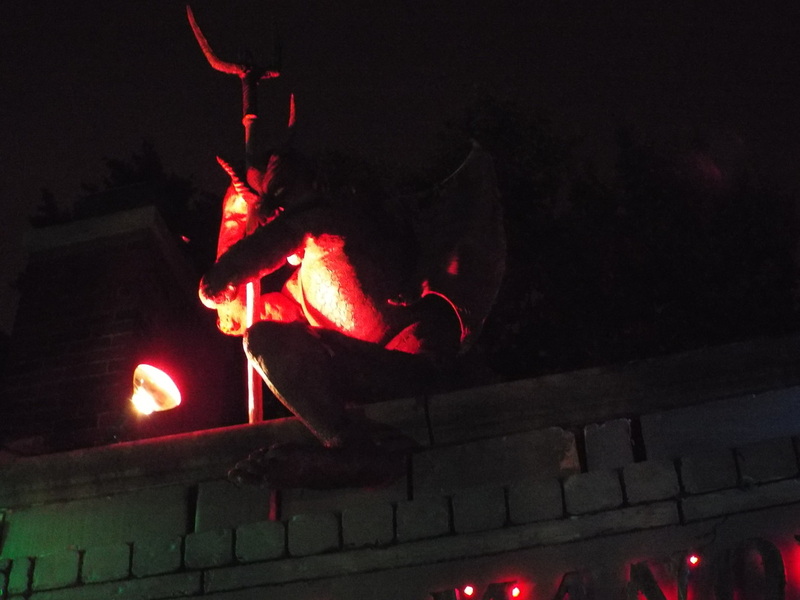 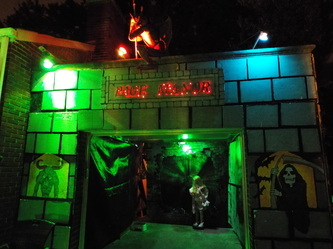 The garage was also done up, featuring simulated grey bricks on the outside (much like a castle), a sign in red neon over the door with the name “Page Manor,” and a red devil figure with pitchfork sitting on top of the garage roof. 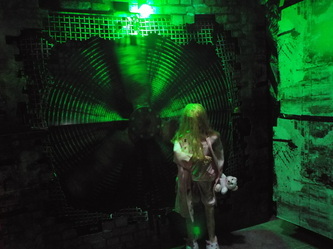 Inside the garage was a large fan blade, lazily rotating under a green light and a strobe light. In front of the fan was a little girl dressed like the zombified girl from the first episode of The Walking Dead. 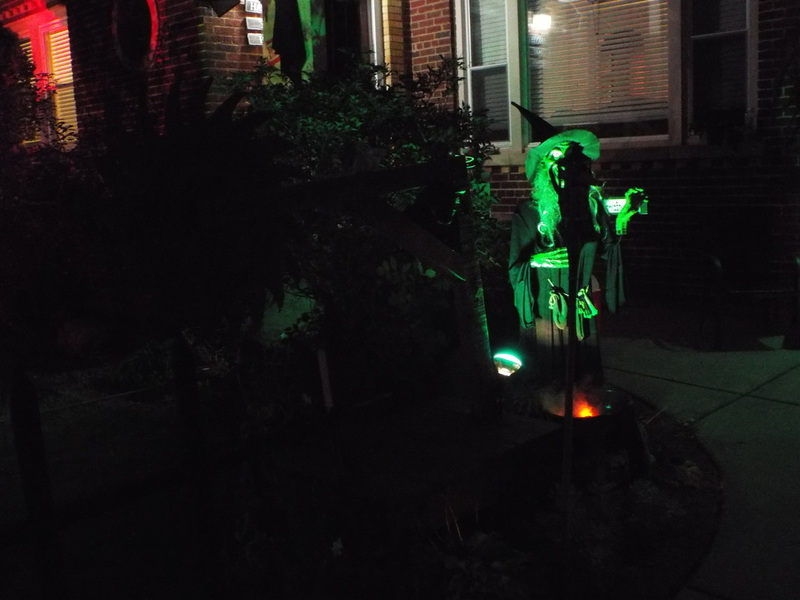 Seeing the lone figure in the garage and watching the light play across the large fan blade ( which was also making an odd sound each time it rotated) make for an eerily effective display.The front of the second house was also very well done and, as mentioned, focused more on the macabre aspects of Halloween. In the back of the display was a full size guillotine, which is not something one sees every day. 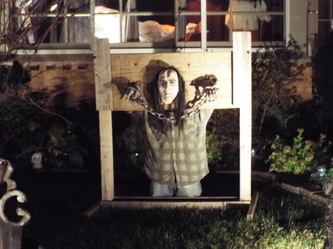 Also taking up some prime space was a gallows with a full size hanged man on it, along with several old-fashioned tombstones and a number of black wooden coffins of the type used in the 19th century. The most effective part of this display, in our opinion, was what was set up in the front windows and by the front door. 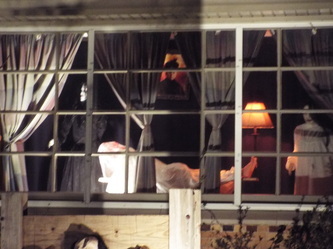 The main windows featured what looked like a Victorian-era parlor setting, with two life size female figures in period dress. 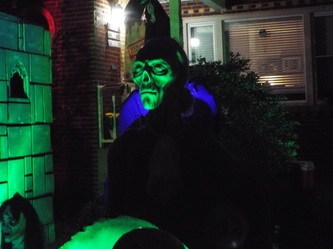 One was in black and other in white. Both looked creepy, and both were standing around a body covered in a bloody sheet. An odd, ghoulish portrait hung from the wall behind them. 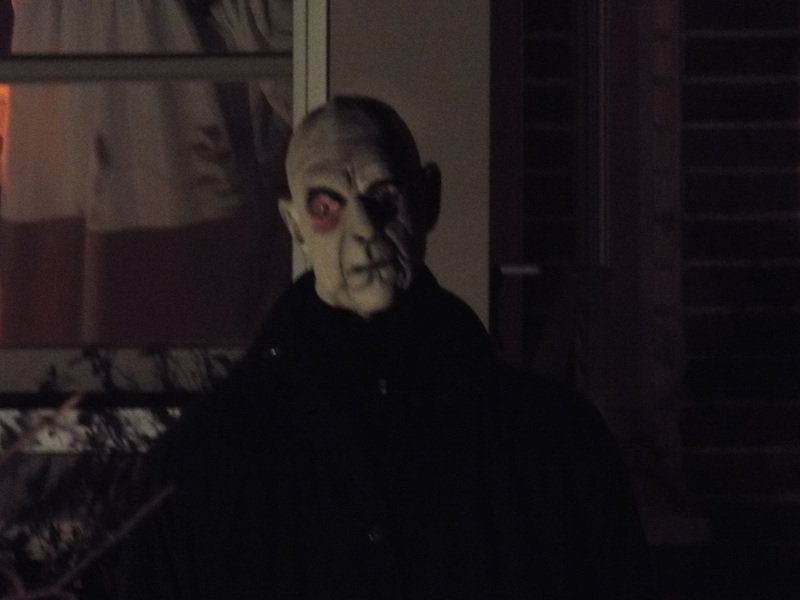 It was suitably unusual and unnerving, as was the odd figure behind the front door that resembled a screaming skeletal ghoul in a top hat. 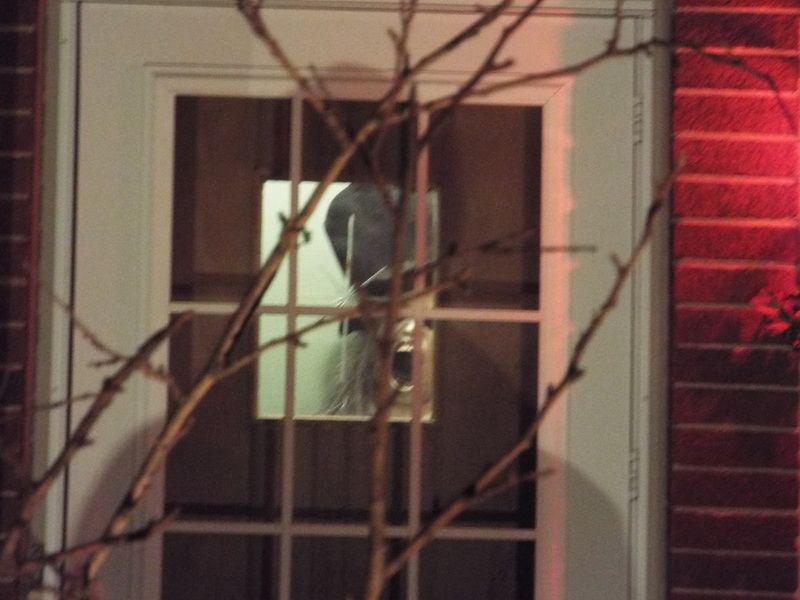 Seeing him peering out from behind the front door was a nice touch! 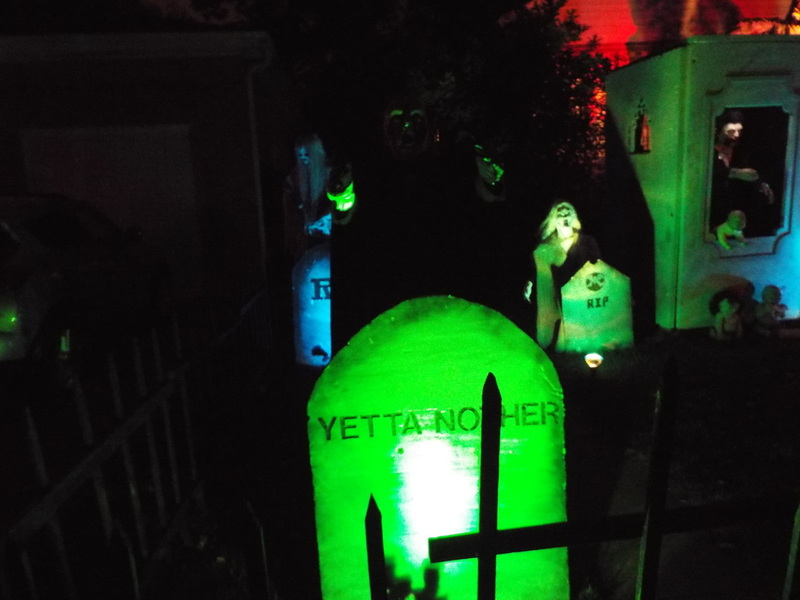 Overall, we really enjoyed this display. There was a large amount to see, and it was an effective mixture of the funny, the creepy, and the bizarre. We’re glad we took a look, and we look forward to next year to see what else the owners come up with!